Explore recent home sales & more. Selling your home? Browse our seller resources. 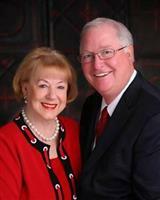 "We have bought 4 houses and sold 3 houses with Martha and Gerald during our 25 years of living in north Texas. They are both consummate professionals and on top of that they are great people to know! They both work so hard for their clients whether it is selling a current home or finding the perfect new home. The best testimonial we can give for Martha and Gerald is the fact that we have recommended them to many of our friends, who have further recommended them to their friends!" "[The Robertsons] did an amazing job helping us buy our dream house in record time, and they looked out for us in every step of the process! More than that, [when we] decided to rent out our property in Frisco, again they did in record time but with extreme diligence and acted as true consultants throughout the process, looking out for us and educating us along the way. To top it off, they too referenced us to an extremely reliable real estate agent in Houston where we had another exceptionally positive experience. Simply outstanding service and true dedication to their clients!!! A true blessing." "For over three decades, Gerald and Martha Robertson have consistently provided their clients with innovative and creative negotiating skills and a tenacious focus on completing the transaction with integrity. From finding a neighborhood to successfully seeing families in their new home, Gerald and Martha use their well-tuned listening skills and knowledge of the marketplace to guide their clients through the emotional and exciting home buying experience. The same formula applies when strategically marketing for sellers, using cutting edge technology along with their negotiating skills. The ultimate goal of providing exceptional real estate experiences has earned the trust and confidence of their clients." The Robertson Team is focused on providing you with the best results and service in the industry. We listen carefully to our customers to understand their real estate goals and work hard to create solutions that make sense for them. Whether you are new to the market or are an experienced investor, we have the expertise, proven track record, and resources to help you achieve your real estate goals. As is often said, real estate is about location, location, location. We have extensive knowledge of the North Dallas area and can help you find the right home for you or the right buyer for your home. The Robertson Team, looks forward to meeting you and discussing your real estate needs. stems from experience, proven success and personal commitment to you.